John Wiley & Sons (NYSE: JWA) reported earnings on Sep. 10. Here are the numbers you need to know. 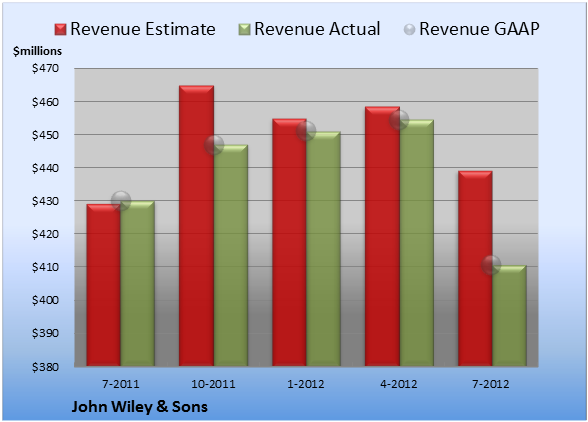 For the quarter ended July 31 (Q1), John Wiley & Sons missed estimates on revenues and whiffed on earnings per share. Compared to the prior-year quarter, revenue shrank and GAAP earnings per share dropped significantly. John Wiley & Sons logged revenue of $410.7 million. The two analysts polled by S&P Capital IQ expected to see revenue of $439.2 million on the same basis. GAAP reported sales were 4.5% lower than the prior-year quarter's $430.1 million. EPS came in at $0.52. The two earnings estimates compiled by S&P Capital IQ anticipated $0.73 per share. 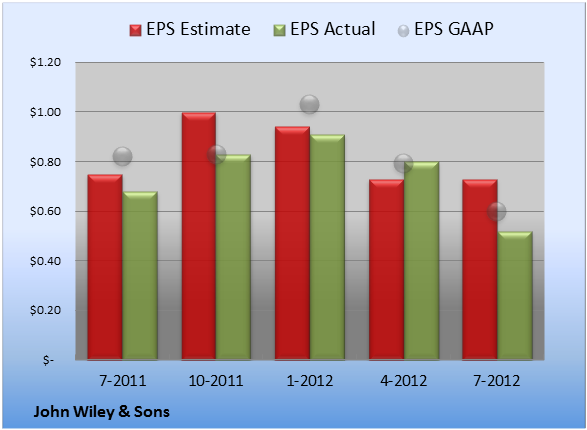 GAAP EPS of $0.60 for Q1 were 27% lower than the prior-year quarter's $0.82 per share. For the quarter, gross margin was 69.0%, 80 basis points worse than the prior-year quarter. Operating margin was 10.7%, 330 basis points worse than the prior-year quarter. Net margin was 8.8%, 300 basis points worse than the prior-year quarter. Next quarter's average estimate for revenue is $449.8 million. On the bottom line, the average EPS estimate is $0.90. Next year's average estimate for revenue is $1.80 billion. The average EPS estimate is $3.38. Of Wall Street recommendations tracked by S&P Capital IQ, the average opinion on John Wiley & Sons is outperform, with an average price target of $53.75.